12 for each month of the year. 31 for each day of any given month. It allows you to organize, access and act on time sensitive documents at the time you decide is most appropriate. Of course, when I say time sensitive, I'm referring to anything you decide to do on a particular day, regardless of whether it needs to be done that day or not. … and so on, as and when you want to. Each day, check the contents of the folder for that day and act on each one as required. It works particularly well if you do all your tasks in one burst.It works particularly well if you do all your tasks in one burst, but you certainly don't have to do it that way. During the day collect anything that you decide to put your system and either do so then or, if you have several things to add, batch them together in a daily folder (call it ‘Today’s Ticklers’?!) and file them in one go at the end of the day. Paper based. This can be created to suit however you process your tasks best. Filing cabinets, index cards or ring binder folders can be used. Computer based. Particularly useful for organizing emails. Create folders for days and months, then put time sensitive information in the appropriate folder. Adapt your filing system to suit your circumstances. 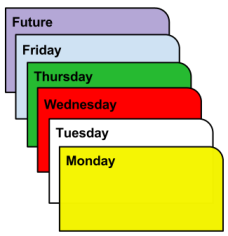 Alternatively, create folders for each working day of the month plus the 12 monthly folders. The tickler system only works if you use it daily, so make it as easy to get to and to use as possible.